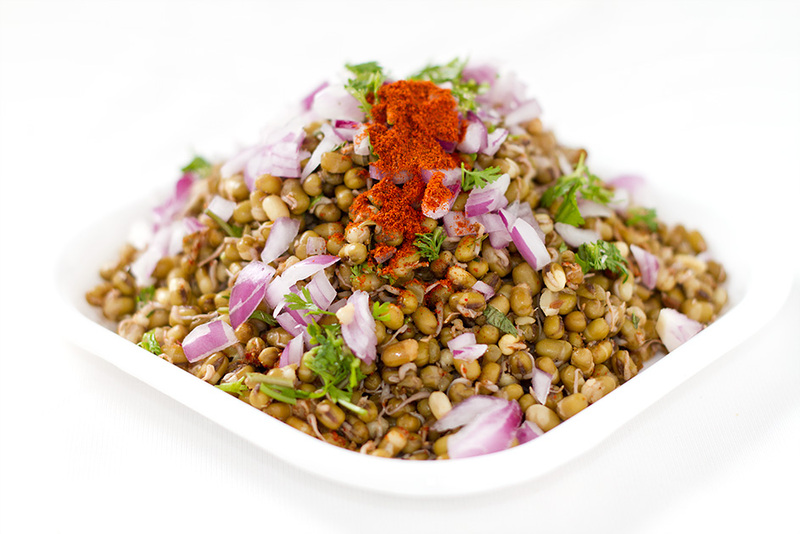 Sprouts Chaat is another diabetes friendly recipe. Full of healthy proteins, carbs, vitamins and fiber this snack will keep you satiated and your doctor very happy. This colourful, tangy and spicy dish will take some planning (you have to soak the beans a day in advance to make sprouts) but its completely worth it. And what makes it a winner is you have complete liberty to add more ingredients and make it spicier or tangier exactly as per your tastes. So go on, feel free to indulge and add a boiled potato or use a chopped tomato instead of lemon juice. You can even use amchur powder if you don’t have tomatoes or lemon at home. In a non stick pan heat oil and add asafoetida and cumin seeds followed by chopped and deseeded green chilles. As soon as the cumin sputters, add bean sprouts and salt. Cover and cook the sprouts for about 5-7 minutes. Cook till the sprouts get completely steamed but still retain some crunch. Remove from pan and mix Cumin powder, red chile powder, kala namak and lemon juice. Garnish with onions and coriander and serve as a snack. Sprouting, like cooking, reduces anti-nutritional compounds in raw legumes. Raw lentils for example contain lectins, antinutrional proteins which can be reduced by sprouting or cooking. Sprouts are said to be rich in digestible energy, bioavailable vitamins, minerals, amino acids, proteins, and phytochemicals, as these are necessary for a germinating plant to grow. These nutrients are essential for human health. For home sprouting, the seeds are soaked (big seeds) or moistened (small), then left at room temperature (13 to 21 °C or 55 to 70 °F) in a sprouting vessel. Many different types of vessels can be used. One type is a simple glass jar with a piece of cloth or nylon window screen secured over its rim. “Tiered” clear plastic sprouters are commercially available, allowing a number of “crops” to be grown simultaneously. By staggering sowings, a constant supply of young sprouts can be ensured. Any vessel used for sprouting must allow water to drain from it, because sprouts that sit in water will rot quickly. The seeds swell, may stick to the sides of the jar, and begin germinating within a day or two. Quite easy & appetising chaat!